ACL surgery scheduled for Feb. 16th. Long story short, while playing football on Nov. 1st. 2009 with 28 seconds remaining before the half, I was running down field (without any contact) I felt & heard "the pop". I dropped immediately. My MRI showed no meniscus or cartridge damage. 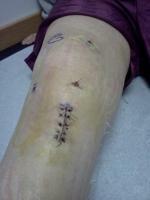 Just a right ACL tear. After 2 months of therapy, I met with my surgeon yesterday. Because of my age 39 I have the option of NOT having the surgery if I alter my lifestyle. He asked me how I feel about NOT playing sports again. I told him not playing is NOT an option! So we scheduled it. My surgeon is one of the best of not the best in Philly. I have all the confidence in him. To be honest with myself, I am a little nervous and scared. I guess that's natural. A lot of your stories help and I learned a lot from them. I take everything as a competition and a contest. My knee and my surgery is a contest that I will NOT lose. That's my motivation and I'm ready for it! I will update my story as I hope it helps others! Ps. I'm a young, active 39 year old. Everyone is telling me I'm too old to be playing sports (also my motivation). I also play ice hockey & baseball. SPORTS IS MY PASSION! If you don't understand that or you no longer have a passion than maybe I'm not the one that's too old?